The summer of 1995 welcomed the first Brazilian to play in the Premier League. Prior to this in November 1991, Elton Welsby and the 'European Match Live' had screened Arsenal's European Cup second round, second leg tie against Benfica, a clash the Gunners were expected to win for progression to the group stage. Colin Pates opened the scoring but it was a mercurial, bearded midfielder who stepped up and inspired the Portuguese giants to a 3-1 victory with two fine goals and an assist in his finest moment in football. 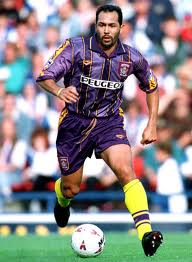 Ron Atkinson signed Isaias Marques Soares from Benfica for £500,000 in the summer of 1995 on a two-year contract. His debut inspired the Sky Blues to a stunning 45 minutes of football (we were unable to play for 90 minutes even back then) as Manchester City were put to the sword at Highfield Road. Most of Isaias' 14 appearances were made prior to Christmas with fitness the main issue. During this time he became the first visiting player to score at the Riverside and swept in a fine finish arriving late into the box at Chelsea. Isaias brought flair to Coventry, a big name player who lined up alongside Nii Lamptey and Peter Ndlovu, as you would expect from a 'Big Ron' team. That first half against Manchester City was exhilarating, Paul Telfer headed in Ally Pickering's cross as Isaias sprayed the ball around from his pivotal spot in central midfield. Following his injury-plagued time at City, Isaias transferred to Campomaiorense in the Portuguese Third Division for two seasons before he concluded his career with cameos at Brazilian sides Cabofriense and Friburguense. His five seasons at Benfica (1990-95) brought him worldwide recognition and a move to the Premier League. He displayed flashes of his undoubted ability, it was just a shame that injuries caught up with him. His final game in English football came as substitute in our 1-0 defeat to Liverpool in September 1996 as he failed to feature during Gordon Strachan's tenure. Mark Robins was the man whose winning goal at Nottingham Forest in the 1990 FA Cup third round saved Sir Alex Ferguson from the sack and went on to score the winning goal against Oldham in the semi-final as you can see below. Many former United players have gone on to have successful managerial careers no doubt influenced by their former gaffer. He'll need to change the culture as its been said many times down the years by various managers and continually by the fans. The core is rotten, when the side trail you may as well leave the ground, there's no supporter expectation that they can triumph following any kind of adversity. Upon Robins' appointment he said "If we can turn things round here it will be fantastic." He could not have put it better, if success is achieved he'll have the freedom of the city. For far too long the players have had the freedom of the dressing room, now is the time for change at our beloved club. Let's hope Mark Robins can bring back the glory days for the Sky Blue Army, for that we will be eternally grateful.